Mr. President, tell me again why we're in Afghanistan? The continuing - and deadly - protests against American troops and facilities in Afghanistan in response to the destruction of Qurans that had been used to pass messages between detainees at Bagram air base again raise the still unanswered question - why are we still in Afghanistan? Instead of rushing for the exits prematurely in Iraq, perhaps President Obama and his advisors should be reassessing our continued presence in a country that as far as most analysts believe has no strategic American national interest. 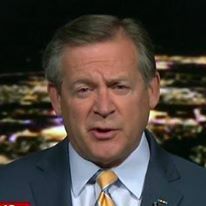 Like most Americans, I understood and supported the initial military operations in Afghanistan in the wake of the al-Qa'idah attacks of September 11, 2001. Those operations came after the Taliban government of Afghanistan refused to turn over Usamah bin Ladin to the United States. 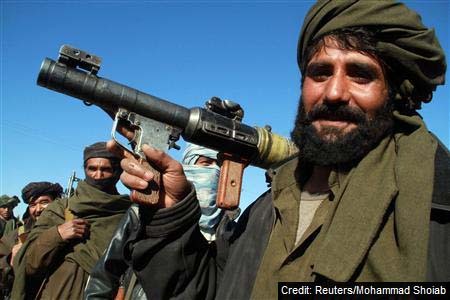 U.S. forces, working with the anti-Taliban Northern Alliance, soon took the capital city of Kabul and removed the Taliban from power. The troops then focused on eliminating al-Qa'idah. Al-Qa'idah fighters ran for the relative safety of the mountains along the ill-defined and porous border with Pakistan. Many of the fighters were killed, some were captured, and some - including bin Ladin - were able to escape to Pakistan where they were sheltered by the Pushtun tribes and possibly the Pakistani intelligence service. Follow-on military operations effectively removed al-Qa'idah from Afghanistan. As I recall, the mission of the American invasion of Afghanistan was to kill or capture as many al-Qa'idah fighters as possible and deny then a future operations base in the country. That mission was accomplished early on. Al-Qa'idah abandoned Afghanistan for Pakistan, and later moved on to Iraq, Saudi Arabia, Yemen and Somalia. If the actual enemy of the United States was/is al-Qa'idah, we should have been attacking them wherever they were/are. Instead, we - and I hold the Bush Administration accountable for this - embarked on a massive nation building effort to establish a Western-style democracy in a country that barely has any paved roads. Why? What national interest does that possibly serve? That's not a rhetorical question - I would really like an answer. Now we have almost 100,000 American and NATO troops in Afghanistan battling the Taliban. As far as I can tell, the Taliban is not a threat to the security of the United States. True, they are attacking our troops, and thus we should be killing as many as possible. That said, I have to ask, is the Taliban really interested in anything more than having us leave? I doubt if they are going to follow us back home. After watching the Afghan people in the street protesting in front of the U.S. Embassy shouting "death to America," after reading that an Afghan intelligence officer killed two American troops over this issue, I believe it is time to leave these ingrates to their own fate. As with many of the people in this part of the world (and I'm going to get hate mail accusing me of being anti-Muslim...), they appear incapable of rational thought when it comes to these perceived religious slights. I think we should announce that we've had it and we're leaving. However, on the way out, we should bring down on the remaining Taliban areas massive bombardment the likes of which they have never seen. That will serve as a warning of the fate that awaits them if they allow al-Qa'idah or any other transnational terrorist group to set up bases in the country in the future. We used to have the political will to inflict real damage on our enemies. I would also retract the multiple apologies for the burning of the Qurans. It was not our troops who desecrated the holy books, it was the detainees at Bagram air base who used them to pass messages among themselves. Good bye, good riddance, good luck. As the internal security situation in Syria continues to deteriorate and the nuclear standoff with Iran becomes more bellicose, there has occurred a conflation of the two crises into one overarching problem in the region. It is virtually impossible to address one of the two issues now without either addressing the other or at least considering the larger regional consequences. Last week, that conflation took the form of a visit by two Iranian warships to the Syrian port of Tartus, coincidentally the same port used by Russian warships when they visit the Mediterranean. This is the second visit of Iranian warships to Syria in the last two years - two Iranian warships conducted an identical visit exactly one year ago in February 2011. See my article on that earlier visit, Iranian warships in the Mediterranean - deal with it. 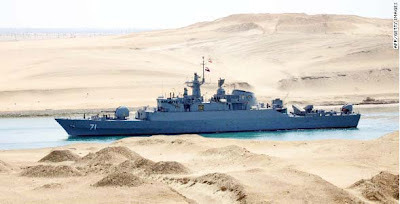 The last visits by Iranian warships prior to these recent visits were over 30 years ago. Iran is "showing the flag" in what it considers its sphere of influence in Middle East, and demonstrating its continuing support for its closest ally - the Ba'th Party regime of Syrian President Bashar al-Asad. Unlike Libya's Mua'mar al-Qadhafi, who had no allies to support him against the Libyan popular uprising, al-Asad has a close ally in the Iranians, as well as enjoying differing levels of support from Russia and China. It was both Russia and China who vetoed a United Nations Security Council resolution condemning the Syrian regime for the violence against its own citizenry. Although China's steadfast support for the dictator may be waning somewhat, Russia continues to stand by al-Asad and sternly warn against any type of intervention in Syria. The Syrian-Iranian axis goes back decades and is rooted in the Iran-Iraq War that raged for almost eight years from September 1980 to August 1988. Virtually every Arab nation except Syria stood with their fellow Arabs in Iraq against "the Persians" - the Iranians. Animosity between the Persians and Arabs goes back thousands of years. Syria, however, chose to ally with Iran. There were several reasons that drove the leaders in Damascus and Tehran into each others' arms. At the time of the outbreak of the war, the Syrian and Iraqi governments were both under the control of the Ba'th Party, however, the two wings of the party had taken different paths on the road to Arab Socialism and had developed an emnity that occasionally resulted in bloodshed. When Iraq invaded Iran in 1980, then-President Hafiz al-Asad (father of the current Syrian dictator) allied with the enemy of Baghdad. This is in keeping with the Middle East adage, "the enemy of my enemy is my friend." The initial relationship expanded into an economic and military alliance. In return for access to Syrian air bases allowing Iranian fighters to operate from Iranian bases east of Iraq and recover to Iraq's west in Syria, Iran provided Syria with millions of barrels of oil that could be resold on the world market to prop up the weak Syrian economy. The two became closer as the war raged. In 1982, Iran saw an opportunity to expand its sphere of influence into Lebanon, home of a sizable - and growing - Shi'a Muslim population. It did this by deploying members of its Islamic Revolutionary Guard Corps (IRGC) to Syria and Lebanon. That organization, the IRGC Syria and Lebanon contingent (IRGC/SL) was the nucleus for the creation of the now notorious IRGC Qods Force, an elite covert/special operations unit. The IRGC/SL group, based in a suburb of Damascus, moved into Lebanon's al-Biqa' Valley and created the Party of God, more commonly known by its Arabic name - Hizballah - to combat the Israeli invasion of southern Lebanon launched to rid Israel's northern border of the threat of attack from Lebanon-based Palestinian guerrillas. As it turned out, Israel merely traded one threat for another, the Palestinians for Hizballah. Hizballah was much more lethal, as history has shown - the 2006 war between Hizballah and Israel is a prime example. After that war, Iran and Syria completely replaced all of Hizballah weapons, this time with even more capable rocket and missile systems. Training, funding and resupply of Hizballah was routed through Syria, mostly via the international airport in Damascus - that support continues to this day. The ability to use Hizballah as a proxy force against Israel, by either Damascus or Tehran, is an integral part of the foreign policy of both Syria and Iran and is key part of their relationship. Should the al-Asad regime fall, Iran would be hard-pressed to control or maintain Hizballah, and its influence in Lebanon would be compromised. Iran is not about to let a major component of its foreign policy disappear without a fight. Although the Syrians and Iranians have had economic and military cooperation agreements in the past, since 2005 they have had a formal mutual defense treaty, pledging to come to each other's defense it the other is attacked. An Israeli attack on Iran will theoretically trigger a Syrian response against Israel. That response will also likely include Hizballah attacks from southern Lebanon. The Syrian military at this time, however, is focused on maintaining order in the country and repressing a popular uprising. Would they have the capability to launch attacks on Israel as well? Would the Syrian opposition abandon their protests against the regime and temporarily unite against a common enemy? Or would they take advantage of the situation and continue to press for the overthrow of Bashar al-Asad? On another front, if there is Western or Arab League intervention in Syria, would Iran attempt to oppose it militarily? If Arab League forces attempt to move against the Syrian regime, will Iranian forces mount attacks on those countries in support of its Syrian ally? If American forces are involved, will Iran strike American interests in the Persian Gulf? Again, I'm pretty good at posing the questions, but don't have the answers. It is important for anyone trying to assess available options to address either the Syrian repression of its own population and the Iranian nuclear weapons program that these are no longer isolated issues. Addressing one will also require addressing the other, or at least taking into consideration the consequences of one action on the other crisis. Specifically, attacking Iran will require consideration of the reactions of Syria and Hizballah. Likewise, intervention in Syria will have to take into consideration what Iran will do. Let me guess - the Iranians will agree to talks, while their centrifuges spin and their allies in Damascus continue to kill their own people. The news reports of the assassination of a Syrian military doctor, an army brigadier, on Saturday in the Rukn al-Din section of Damascus underscores the deteriorating situation in the country. Up until the last few weeks, most of the violence has occurred outside the capital. 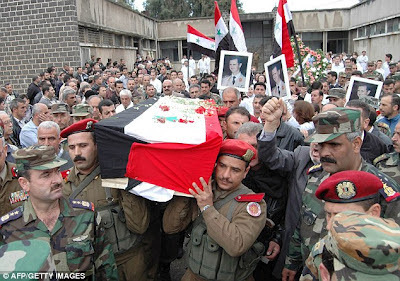 Saturday's killing of an army officer in Damascus threatens to bring the violence to the streets of the capital. The daylight attack on a member of the Syrian armed forces in an upscale section of Damascus has shaken local residents. Even those who have stood steadfastly behind President Bashar al-Asad and his Ba'th Party regime are now wondering if it is time to re-assess their positions. The news of the attack on the army doctor comes at the same time that Syrian military forces unleashed a new wave of armor and artillery assaults on the city of Homs, killing scores in the city. The Asad regime has displayed no remorse in its brutal suppression of demonstrators and protesters throughout the country. That is understandable, since Damascus has received political cover and tacit support from its two allies on the United Nations Security Council, Russia and China - both permanent members with veto power. Both have already used that veto power to stop a resolution condemning the Syrian government's actions against its own people. It is expected that the Arab League will ask the UN Security Council to create a peacekeeping force for operations in Syria. This is dead on arrival for three reasons. First, the Russians and Chinese will veto it; second, the United Nations has an aversion to sending peacekeeping forces into an area until there is some peace to keep; and third and most importantly, the Syrians will not accept it. It is inconceivable that the United Nations will authorize what would in reality be an invasion of Syria. There is at least one precedent, however, for Arab League peacekeeping operations. In 1976, during the civil war in Lebanon, the Arab League created what was called the Arab Deterrent Force (قوات الردع العربية - quwat al-rada' al-'arabiyah) to try to stop the violence in that country. Although the 30,000-man force was nominally composed of troops from six Arab countries, ironically, it was the Syrians who commanded and dominated the force. I was in Lebanon when this happened - it was merely the vehicle for a Syrian intervention that lasted almost 30 years. In a bit if good news, the Sudanese general in charge of the defunct Arab League observor mission to Syria resigned today - he had a terrible human rights record, and his observor group failed to condemn the Syrian government. Corruption in the Middle East? Say it isn't so. Additionally, the Arab League will possibly move to expel Syrian ambassadors from the capitals of member states. Here's a bizarre twist, but symptomatic of things Middle Eastern. The leader of al-Qa'idah, Ayman al-Zawahiri endorsed the efforts of the Syrian National Council to remove the regime of Bashar al-Asad. While this should really not come as a surprise - after all, the Syrian Ba'th party is secular and anti-Islamist, it is an interesting juxtaposition of interests that places our policy in line with that of al-Qa'idah. Of course, the desired end-game would be much different. The United States would prefer to see a democracy emerge in Syria, while al-Zawahiri would like to see the creation of an Islamic republic. The al-Qa'idah connection may go further than just political support. It is beginning to appear that the group known as al-Qa'idah in Iraq (AQI) may be directly involved in some of the recent bombings in Aleppo and earlier in Damascus. These attacks were aimed at government intelligence and security facilities, and are well within the capabilities of AQI. The questions that remain: How long can the Syrian government resist the will of the international community and continue to oppress its own citizens? How far are Russia and China willing to go to prop up Bashar al-Asad? Is there a point when the Syrian army still loyal to the Asad regime will no longer kill their fellow Syrians and instead turn on the government? Is the West willing to intervene militarily in Syria? In my usual insightful way, I have adroitly discovered the questions. Unfortunately, I do not have the answers. I watch these events with great sadness - I lived in Damascus for several years when I was assigned as the air attache to the American embassy there. I have friends on both sides of the struggle, and I wish them all well.